When you're traveling and unable to take your pet with you, we provide a safe and comfortable place for your pet to stay. We've been providing pet boarding as a service to our clients since 1997. All boarders receive personal attention from our caring staff. Pets may be dropped off and picked up during regular business hours Monday through Saturday. The kennel is open Monday through Friday from 8:30 a.m. to 5 p.m. and on Saturdays from 8:30 a.m. to Noon. On Sundays we offer prescheduled pickups only. Reservations are required. Clients are welcome to bring their pet's own food or we will provide our boarders with a high quality pet food. We run the dogs outside in a large, fully enclosed yard three times each day. Rates are $32 per day for canines; $22 per day for cats; and $18 for rabbits, small mammals and "pocket pets". 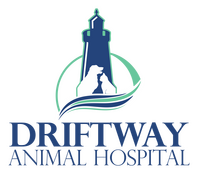 At this time, we offer boarding services only for established clients of Driftway Animal Hospital.